I’m a fan of Steel-Cut Oats. We’ve established that before. I relegated the Quaker Oats man to just a few cookie recipes. Never shall a rolled oat appear in my breakfast bowl. A quick recap of my steel-cut oatmeal recipe has me throwing in a handful of raisins when the oats are just about done and letting them plump up with steam. In the bowl they recipe a sprinkling of slivered almonds and a sometimes-generous pour of maple syrup. 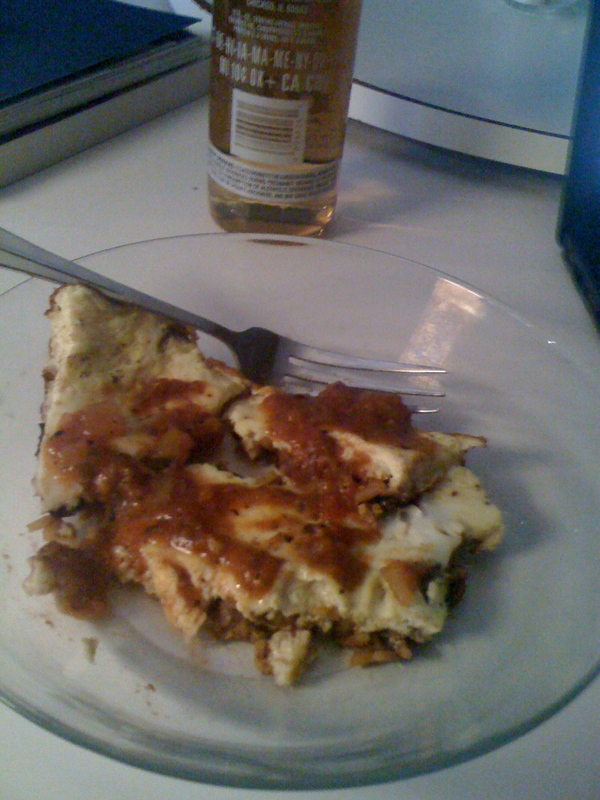 Five out of seven days that’s what I’m eating for breakfast. The other two days? I’ve skipped breakfast altogether. Thanks to Jody and Ken over at The Garum Factory, I now have a new side of steel-cut oats to explore: the savory side. Their last post shined the light on how versatile steel-cut oats can be once you move beyond the sweet expectations. Exhibit A: Their Steel-Cut Oats with Eggs, Preserved Lemon and Olives. For my first time exploring of the savory side, I tread a simpler path. 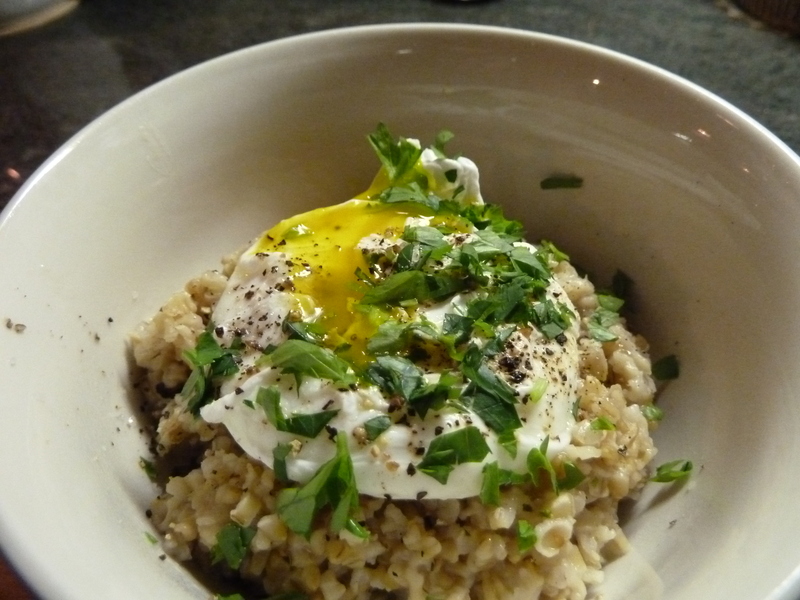 I topped my Steel-Cut Oats with a poached egg, black pepper and parsley. Yeah, delicious. Really delicious. I poached the egg separately, but a friend had a super suggestion: As the steel-cut oats are finishing—let’s say for the last three minutes—make a divot in the oats and crack the egg right into that puddle. 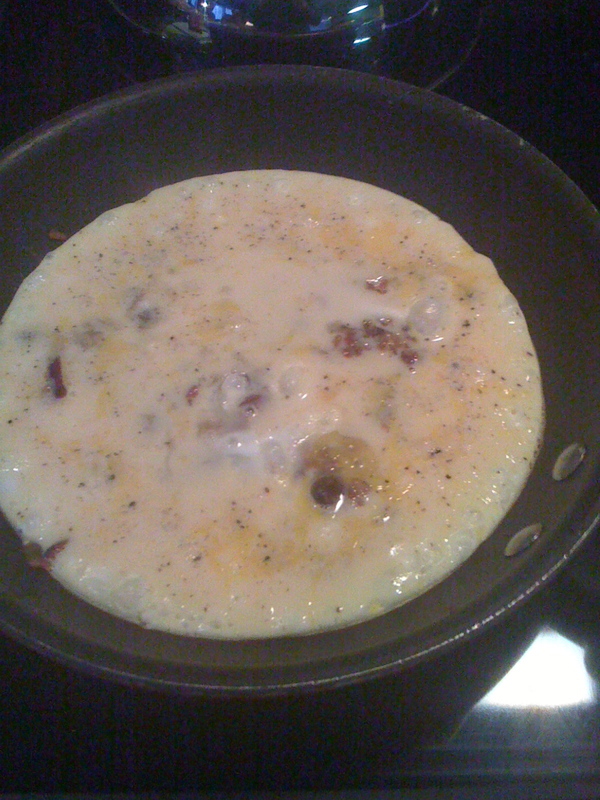 Cover, and the egg “poaches” right in them there oats. And you only have to dirty one pot, she said. Oh, to be as smart as she. Have you explored steel-cut oats’ savory side? What yumminess have you found there? Do tell! Share your savory suggestion—I so want to give it a try. That’s right. Fish aren’t just big slabs of fillets that motor around on their own in the ocean or in a river. They have heads. And tails, too. And fins. They even have guts. All of that—plus the nice fishy flesh—constitutes a whole fish. And that’s what we signed up for when we bought a 5-week share in the Cape Ann Fresh Catch Community-Supported Fisheries (CSF). 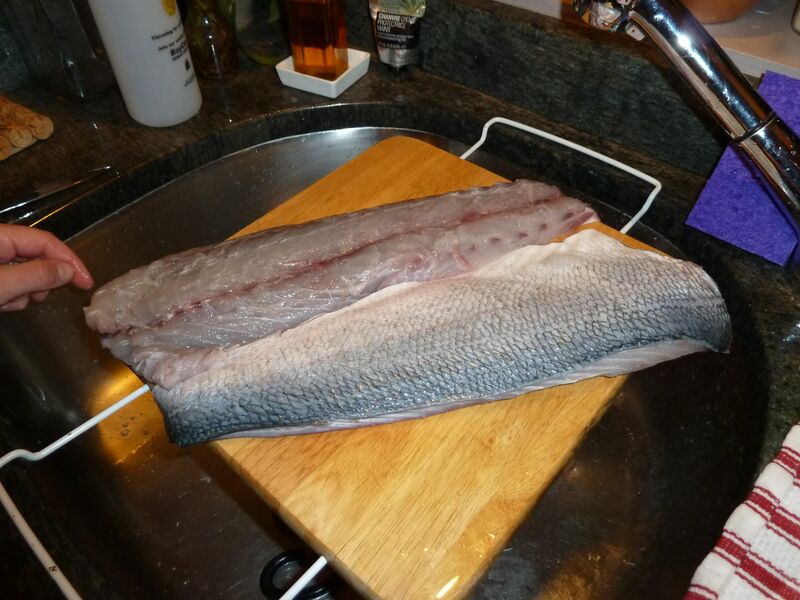 Whole fish one week, fillets the next. Yesterday was our first fish pick-up. “You know you’re getting a whole bluefish today, right?” said the pleasant assistant when I walked into the CSF pick-up location and proudly announcing this was my first-ever fish delivery. Among the millions of dogs-learning-to-talk YouTube videos and clips of hormone-laden boys throwing themselves off suburban rooftops into holly-filled foundation plantings, there are videos that are quite instructional. 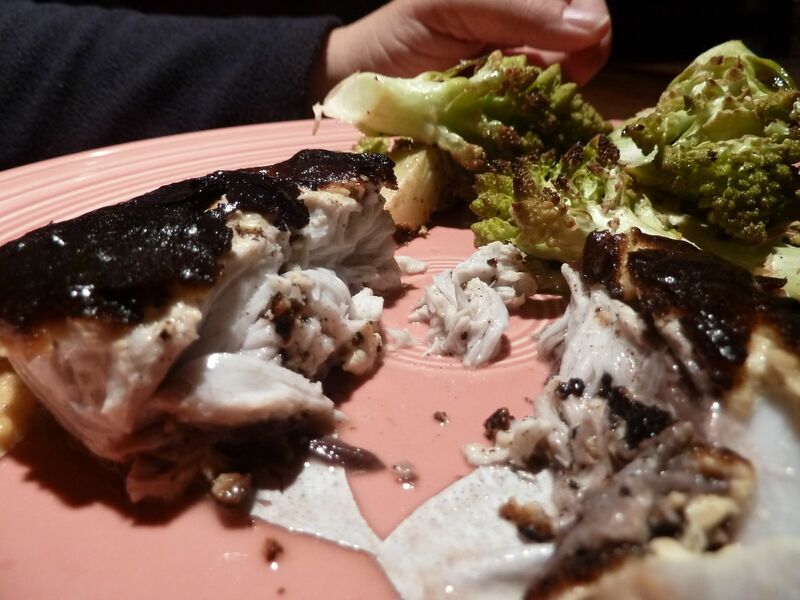 A quick search for “how to fillet a bluefish” netted me two great videos by none other than Tony Maws, chef over at the Craigie Street Bistro in Cambridge. 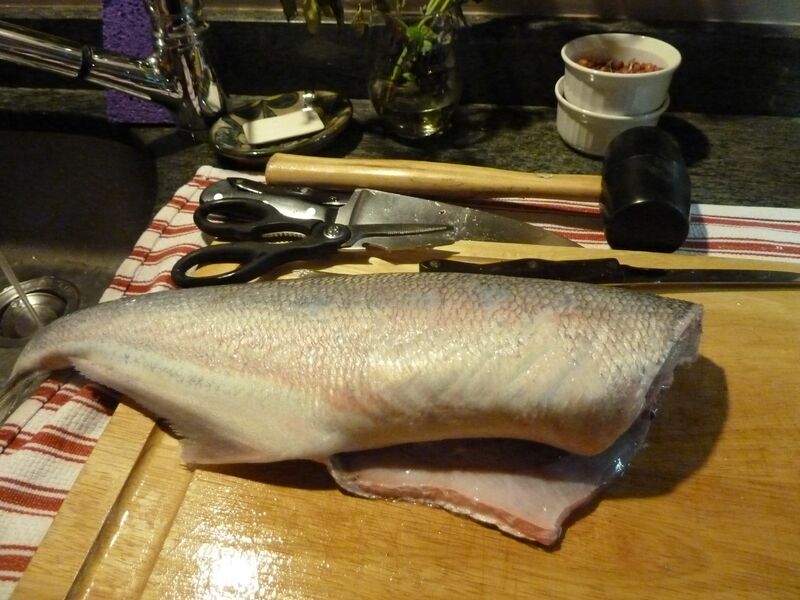 Wanna learn how to fillet a bluefish? Check out Tony’s Part 1 and Part 2. He’s a great instructor—my fillets looked pretty nearly smooth for a first-timer. Tony, I did good! Compare this photo to the one above: Notice how many more tools I have? An 8-in. chef’s knife, a rubber mallet, kitchen shears. Not kidding. And that was just to remove the head. … some fish heads, tails and an intact spine and bones. Those were chucked into the freezer for a future turn in a stock pot. Also put in the freezer was one whole fillet. The other fillet was quartered, and two of those slabs were stored in the fridge. The other two were headed for the dinner table. For those paying attention, this meal falls into Day 2 of our Homegrown Food Challenge, and we’re doing our best to keep the ingredients either homegrown or locally sourced. The fish was locally sourced: check. The mayo? Jennifer’s a mayo whipper-upper using fresh ingredients. So yes, if it didn’t come out of a Hellman’s jar, this is locally made and sourced. And boy, does she make a yummy mayo. 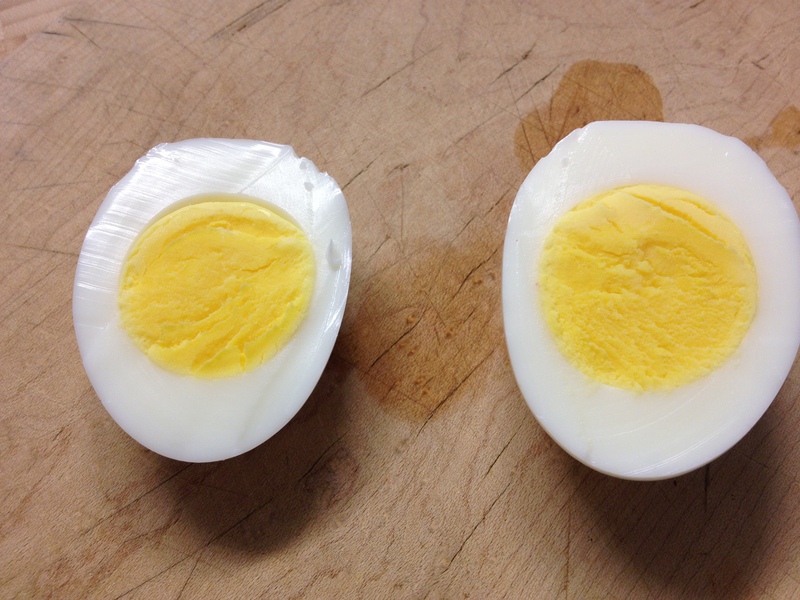 -In a blender or food processor, add the egg yolk and super-slowly (Jennifer’s exact words) drizzle in the oil. Super. Slowly. It’ll start to thicken and look mayo-ey. That’s a good thing. Want it thick? Less oil. Thin? More oil. -Add in paprika and give it a whir. Taste and add in salt and pepper to your liking. Then add in the lemon juice and whir some more. This’ll give you WAY more mayo than you’ll need for two or even four individual fillets. Have fun with the rest of it! We’re thinking grilled eggplant paninnis. Refrigerate and use within two to three days. -Place your oven’s top rack under the broiler and set your oven on broil. Let that heat up good and hot. 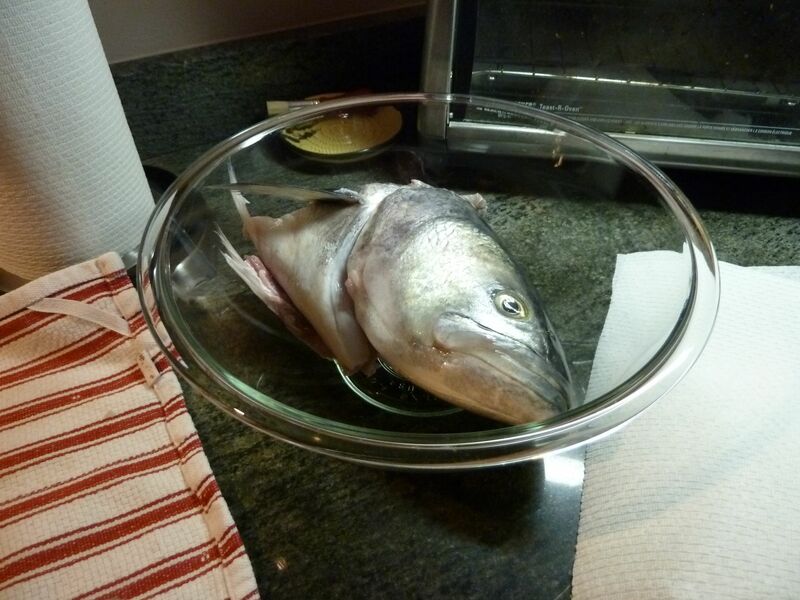 -Meanwhile, place the bluefish fillets in an ovenproof baking dish, skin side down. Spread 1 to 1.5 Tbs. smoky mayo on each fillet. I’d even do a little more than that. Just give the fillet a nice, thick coating of mayo. -When the broiler is ready to go, place the fillets under the heat—7 minutes should do it. But, keep an eye on them. Broiler distance varies and your mayo could scorch. Some scorching is okay, but you don’t want grizzled char. 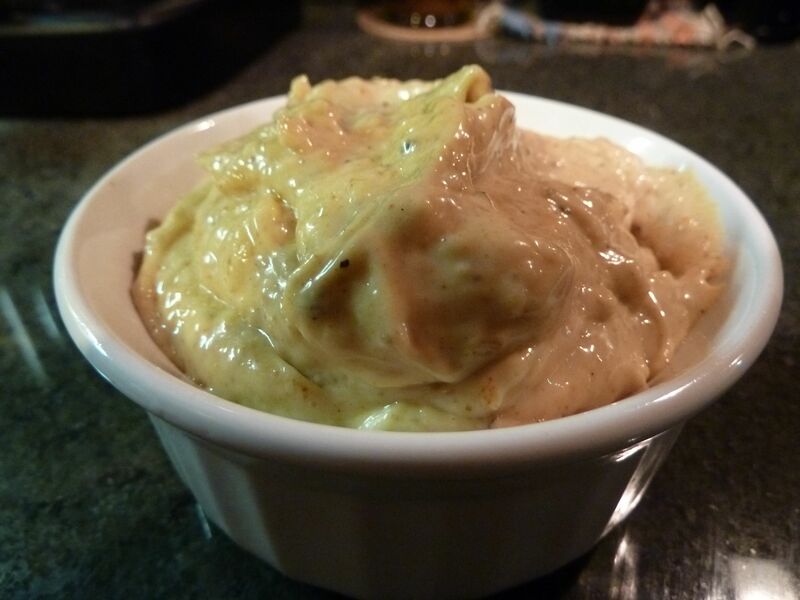 The mayo holds in the fish’s moisture and adds a tasty smokiness to the fish. Really quite nice. 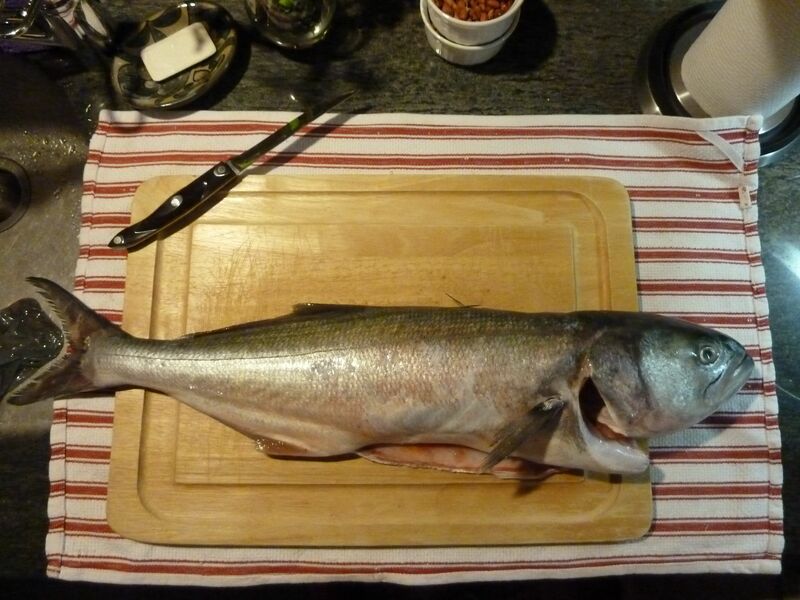 I know some think bluefish is … fishy. I grew up eating bluefish, so I had no worries. Jennifer quite liked the fish’s flavor, too. 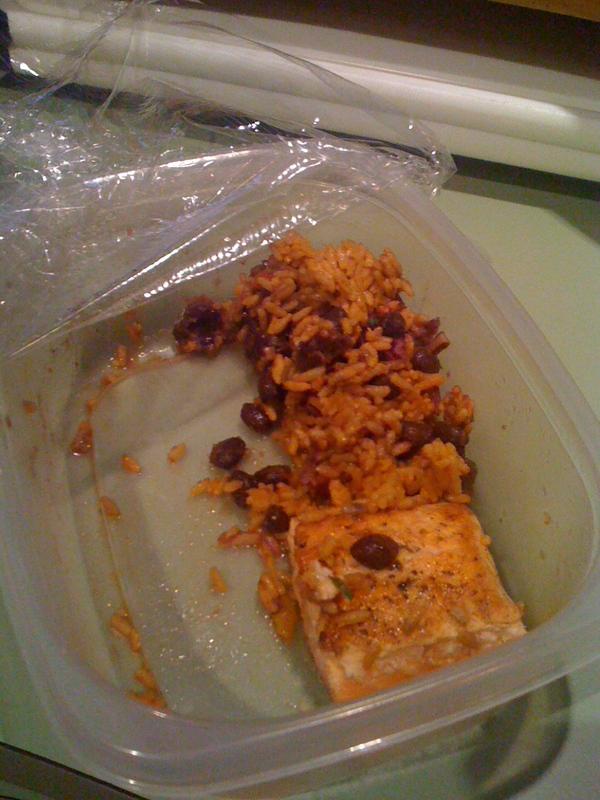 Plus, the fact that the fish was alive and swimming earlier that morning had a whole lot to do with the awesome flavor. Oh, that green stuff over there on the other side of the plate—that would be roasted romanesco. You are currently browsing the eggs category at The Dainty Dot.